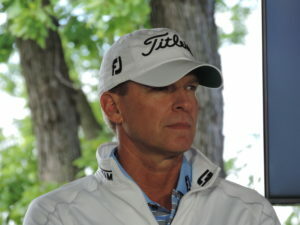 U.S. Ryder Cup captain Jim Furyk has appointed Madison’s Steve Stricker as a vice captain for this years team on Tuesday. Tiger Woods was also appointed a vice captain. Davis Love III was selected to assist Furyk earlier. Stricker will be a vice captain in the third straight Ryder Cup tournament. It comes after he served as team captain at last falls Presidents Cup. The Ryder Cup matches are the last week of September outside of Paris. Jhonattan Vegas shot a 5-under par 65 on Friday to tie Scott Langley for the 36-hold lead at the Greenbrier Classic in White Sulphur Springs, West Virginia. Vegas and Langley are at 9-under at the midway point of the event. Twenty three golfers were within three shots of the lead, including seven at 8-under. Tiger Woods shot a 69 Friday and was at 5-under par, four shots off the lead. Madison’s Steve Stricker finished with an even par 70 on Friday which left him at -1 for the two rounds. That left Stricker short of making the cut to the weekend, his first missed cut at a tournament since 2010. Menomonee Falls native Mark Wilson also missed the cut. World #1 Rory McIlroy fired a 4-under par 67 and takes a one shot lead to the third round of the PGA Championship at Valhalla Golf Club in Louisville, Kentucky. The 25-year-old McIlroy is trying to win his third straight tournament. He takes a one-stroke lead over Australian Jason Day and Jim Furyk into the third round and is two shots in front of Rickie Fowler, Ryan Palmer and Mikko Ilonen of Finland. McIlroy said his goal for the weekend is to try to put as much distance between him and his pursuers as he possibly could. It’s a crowded field though. Fifteen players are within four shots of the lead, including 2005 PGA champion Phil Mickelson, who climbed into a tie for seventh with a 67. Madison’s Steve Stricker shot a 3-under par 68 who stands with Mickelson at 5-under. Dustin Johnson is taking a leave of absence from golf to seek help for “personal challenges”. 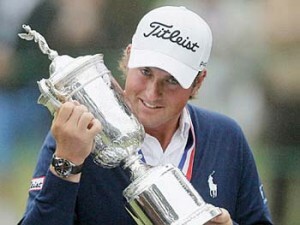 The move ends his season and will keep him from playing the PGA Championship, the FedEx Cup playoffs and the Ryder Cup. “I will use this time to seek professional help for personal challenges I have faced,” Johnson said in a statement. 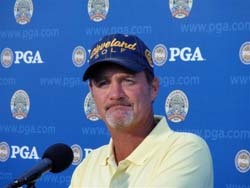 Madison’s Jerry Kelly will take Johnson’s spot in next week’s PGA Championship. Kelly was in the first alternate position and was the first to join the PGA field when Johnson pulled out. The PGA Tour stop this week is in Akron, Ohio for the Bridgestone Invitational. Marc Leishman of Australia fired an opening round 6-under par 64 to take a 1-shot lead into today’s second round. Tiger Woods had a good day. He bounced back from three bogeys with three birdies and opened with a 2-under 68. It leaves him four shots back. 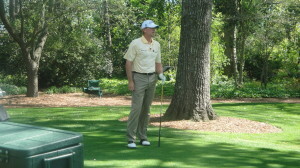 Madison’s Steve Stricker struggled with a 4-over par 74 on opening day and finds himself 10-shots off the lead. Woods first played at the Masters back in 1995 and has been a huge ratings draw ever since. He’s won four green jackets and finished in the top 10 nine other times. But Woods won’t be at Augusta this week after undergoing back surgery. Some claim that there’s so much young talent on the PGA Tour now that golf can get along if Tiger Woods isn’t around. Others feel there’s a big void without golf’s biggest name. Among them is Madison’s Steve Stricker who has drawn close to Woods, with the two playing several Ryder Cup events together. both went winless at the 39th Ryder Cup as the U.S. fell apart on the final day to lose the Cup 14 1/2 to 13 1/2. The Americans started the day with a 10-6 advantage and blew the lead. Stricker lost three times with Tiger Woods as his partner and then lost his singles match on Sunday to Germany’s Martin Kaymer 1-up. The 45-year-old Stricker was one of U.S. Captain Davis Love III’s four at-large picks. The only American points on Sunday came from Dustin Johnson, Zach Johnson and Jason Duffner. A 7th place finish for Madison’s Steve Stricker at the PGA Championship over the weekend. That leaves Stricker out of the top 8 places for the U.S. Ryder Cup team. U.S. Captain Davis Love III will make the four final picks in three weeks but he made it clear that Steve Stricker would be one of those selections, to serve as Tiger Woods playing partner. The first group hit the tee-box at 12:30 AM Cst at Royal Lythum and St. Annes in England to open up the 2012 British Open. It is the 3rd of 4-majors on the Golf calender. Of the early golfers, Tiger Woods, Bubba Watson, Adam Scott and a few others were giving chase at the tournament record lowest opening round which is 6-under par. You can take a look at the current leader board HERE. Steve Stricker and Mark Wilson are both in this year’s field. Among active golfers on the PGA tour, Stricker has the most wins (12) without a Major title. Wilson has 5-career wins and is also chasing his first major. The last 9 major winners in golf all have been first time winners. Steve Stricker entered the final round of the John Deere Classic at the TPC Deere Run in Illinois with a chance at a four-peat in the event, however a bogey plagued back-nine left him 4-shots off the lead. Only 4-golfers have ever won the same tournament 4-times in a row; Tom Morris Jr., Walter Hagen, Gene Sarazen and Tiger Woods, who did it twice. you certainly were afforded the opportunity. ESPN and NBC split coverage on Thursday and Friday and then because the tournament was held on the West Coast in San Francisco, NBC provided coverage of the event from 3 to 9pm on Saturday and 3 to beyond 9pm Sunday.